Most Americans know the story. On January 15, 2009, US Airways Flight 1549 departed from LaGuardia Airport, bound for Charlotte, North Carolina. Just after takeoff, the plane ran into a flock of birds and both engines were disabled. The pilot, Captain Chesley “Sully” Sullenberger, was forced to put the plane down in the Hudson River, saving the lives of all 155 people on board. Well, finally, this incredible story has been made into a movie. But, Sully is not the movie that one might expect it to be. 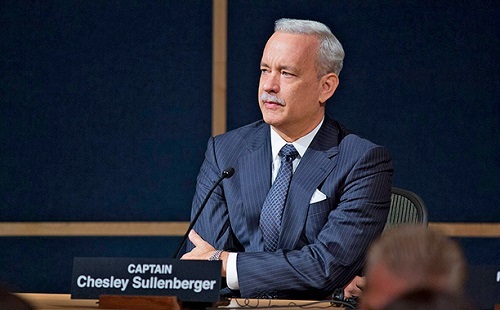 The screenplay for Sully, written by Todd Komarnicki (Perfect Stranger) and based on the book “Highest Duty” by Sullenberger and Jeff Zaslow, deals mainly with the aftermath of the incident, with Sully (Tom Hanks from Bridge of Spies) and his co-pilot, Jeff Skiles (I, Frankenstein‘s Aaron Eckhart), being grilled by a panel of investigators over how they handled the situation. Regardless of how many lives were saved, the National Transportation Safety Board believes that Sully could have found a way to limp the plane to an airport rather than ditch it in the Hudson, and they’ll stop at nothing to try and prove it. It would have been very easy for director Clint Eastwood (American Sniper, Jersey Boys) to just tell Sullenberger’s story simply from the beginning to the end. To his credit, he doesn’t. At least, not directly. Eastwood uses a twisting timeline, full of past memories, alternate presents, and even a handful of nightmarish visions to let the story unfold non-linearly, so the narrative is provided to the audience selectively rather than chronologically. It’s a breath of fresh air in a world full of color-by-numbers biopics. In essence, Sully is part courtroom drama and part disaster film. There are plenty of scenes of formal NTSB hearings and jargon-laden conversations, but they’re broken up by flashbacks that fill in the pieces of the story. The crash itself is shown a few times, but from different points of view, each adding an element or aspect that was missing before. The viewer is engrossed by the slow and deliberate fitting together of the puzzle pieces. It’s all very exciting for such a verbose movie. In a nutshell, Sully is more of the hero worship that Clint Eastwood provided in American Sniper, only with a much more likeable hero. That’s makes it a much more likeable movie. 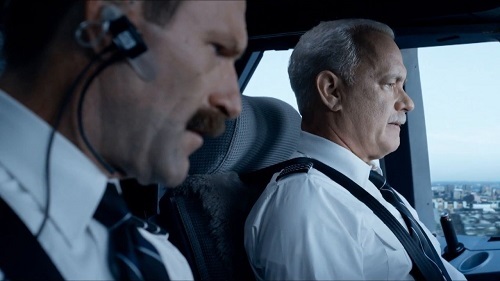 As one might expect, Sully is Tom Hanks’ movie, and he’s great in it. The role of Chesley Sullenberger isn’t too much of a stretch for the experienced and talented actor, but he does well with it. He’s believable, but it’s hard for him not to be, because he’s essentially acting like Tom Hanks. The most intriguing thing he does is make the audience feel the doubt that Sully has in his own memories and abilities once the interrogation is in full swing. It’s remarkable, but that’s what audiences have come to expect from Tom Hanks. Although Sully is absolutely Hanks’ movie, and he owns it, he is surrounded by a capable group of supporting actors that give him plenty to play off of. 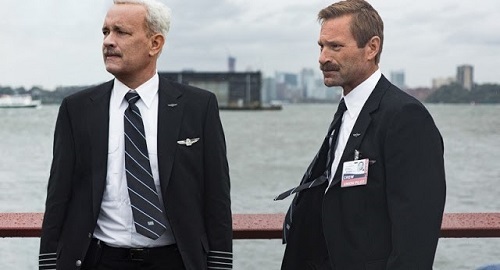 Aaron Eckhart is a great sidekick, with his character of first mate Jeff Skiles treating Hanks’ Sully with respect as well as honesty, knowing full well that they are in it together, for better or worse, in the air or on the ground. Laura Linney (The Fifth Estate) appears as Sully’ wife, Lorrie, who basically serves as a sounding board for the captain’s crippling self-doubt, but she does it with style and grace. And then, there’s the NTSB, which is comprised of Mike O’Malley (Concussion), Anna Gunn (“Breaking Bad”), and Jamey Sheridan (Spotlight), who collectively are as good of a non-violent antagonist as one is bound to find in a movie these days. Hanks may run the show, but the supporting cast in Sully hands it over to him quite admirably.